LARGE numbers of people who want to comment on Calderdale Council’s Local Development Plan are extremely angry and frustrated at how difficult it is to do so, says a Calderdale MP. Calder Valley MP Craig Whittaker has almost completed hosting ten public meetings in his constituency at which a large proportion of those attending - 1,600 people from seven of the meetings to date - expressed anger at difficulties they have submitting comments on Calderdale Council’s website in they way they would like. Follow-up correspondence he has received reinforces the issue, he said. 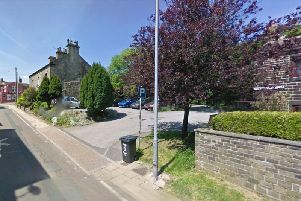 Comments on the plan, which will affect where homes may be built in Calderdale for decades to come, must be with the council by September 29. The council says there are many ways in which comments can be made, and its response to the criticisms is outlined further down this article. “The main concern that people are highlighting time and time again is the lack of infrastructure within the plans and the disproportionate allocation of housing that some communities are receiving. “Furthermore, people are coming forward to say how difficult it is to submit comments to the consultation on the council’s website. “Residents are angry and frustrated that it is so difficult to navigate the website and that there is nowhere where general comments can be submitted – so much so, that many people are giving up even trying to submit a response. He said the way the website is set up means people can comment upon the Local Plan on a ‘line by line’ basis but cannot submit a general comment. “Most people just want to submit a general comment in relation to key points such as the Green Belt, infrastructure, etc and there is nowhere on the website which allows you to simply leave a general comment. To say that this is an omission on the council’s part is an understatement,” he said. The council’s website did notfreely advertise how to submit comments in writing, he said, and people were feeling it was a deliberate ploy to put residents off from commenting on the plans, with a lack of public meetings and consultation being held while many people were away on holiday this summer. Mr Whittaker’s constituency team said they strongly believed that lack of comments at this point “is not because of apathy but because it is so difficult to navigate the website and put comments online. Halifax MP Holly Lynch has reminded constituents of the importance of submitting comments on the Local Development Plan. “The council are in the process of consulting on the Local Plan which aims to meet the Government’s demands for new housing. CALDERDALE Council said it wanted to hear people’s views on the Local Dvelopment Plan and had tried to make doing so as accessible as possible. Calderdale Council’s Cabinet member for Planning, Housing and Environment, Coun Daniel Sutherland, said people could do so online but also in other ways, such as by email or in writing, and explained how to do so, and some drop-in events were being held. “The Local Plan is all about creating the best future we can for Calderdale, and would like to hear your thoughts to ensure the Local Plan meets the needs of local residents,” he said. “We know that there is a lot of information to take in, so we’ve tried to make the consultation as accessible as possible, following other local authorities in the use of an online consultation tool. “Whilst the online system offers obvious advantages to both the user and the council by providing much more information than would be available otherwise, it’s recognised that some individuals prefer to use more traditional methods of communication and view paper documents, and the consultation makes full provision for this through the availability of paper copies in libraries, and for written rather than electronic responses. “We have also produced an easy-read questionnaire which is available in libraries and at a series of drop-in events we are holding around the borough, where you can also find out more information about how to have your say. He said for more information about the Local Plan, visit www.calderdale.gov.uk/localplan, where you can also find the consultation documents. Comments can also be submitted by contacting the spatial planning team at spatial.planning@calderdale.gov.uk or by writing to: Spatial Planning Team, Halifax Town Hall, Crossley Street, Halifax, West Yorkshire, HX1 1UJ. GOVERNMENT requires local councils to produce a Local Plan which identifies land to meet their requirements for new housing and economic development, over the next 15 years. The latest estimates indicate that Calderdale will need over 17,000 new houses by 2032. The Local Plan will show sites where new development, including housing, new schools and community facilities will be allowed and the areas which will be protected. Council information for distribution of housing growth by Local Plan Area, including new housing allocations, sites where planning permissions already exist and windfall sites, indicates around 5,700 homes could be built in Halifax, 6,000 in Brighouse, 2,600 in Elland, 700 in Sowerby Bridge, 250 in Hebden Bridge, 800 in Todmorden, 300 in Mytholmroyd, 2,000 in Northowram and Shelf and 400 in Ripponden. You can submit comments which will be considered while shaping the plan until Friday September 29, 2017.